Initial reports had pegged April 19th as the beginning of the pre-order period for the Droid Incredible, but after the announcement from Best Buy that they would start today (the 18th), Verizon has slightly adjusted their date. Well, maybe. Android enthusiasts can be among the first to purchase the Verizon Wireless Droid Incredible by HTC at Best Buy and Best Buy Mobile standalone store locations. Droid Incredible by HTC, the newest addition to the Verizon Wireless Droid line, will be available for pre-sale purchase on Sunday, April 18. The smartphone will retail for $199 with a new two-year activation. But for whatever reason, our 3 accounts waiting for Incredible updates have not received this email and we’ve also seen no one else across the globe with. The official Incredible site also hasn’t changed. So is it available for pre-order today at VZW or what? Maybe a type-o? It definitely is if you walk into a Best Buy or BB Mobile. Anyone receive this email from VZDub? 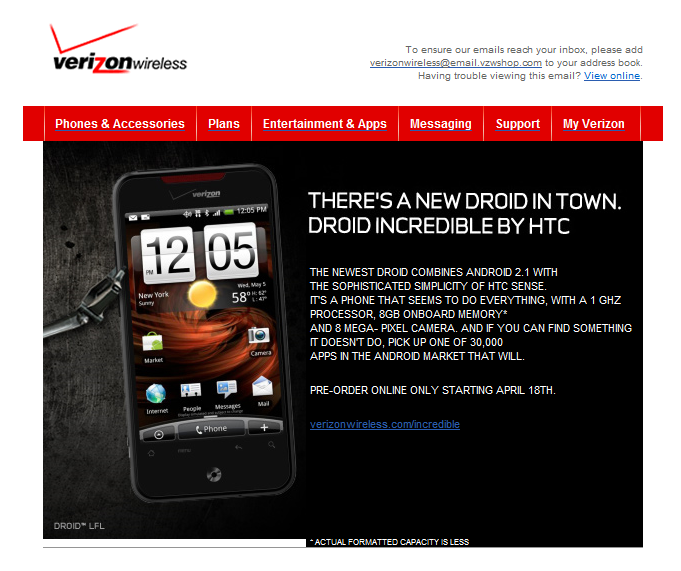 The Droid Incredible by HTC will be available for pre-sale at Best Buy Mobile stores starting Sunday, April 18. Customers will be able to reserve a new Incredible for pick-up once it hits stores later this month. This is an exclusive pre-sale offer that you won’t find anywhere else, including Verizon stores. Stop by your nearest location to stake your claim! Note: pre-sale available in Best Buy Mobile stores only. Online pre-sales are not available at this time. And you know I’ve got to ask right? After seeing yesterday’s video of the Incredible and now with the pre-sale upon us, who’s pre-ordering?